Snoring and obstructive sleep apnea can be treated with lifestyle changes (weight loss, regular sleep routines, change of sleeping position, avoidance of alcohol or smoking, relief of nasal obstruction), CPAP therapy (a medical device that blows air into your nose and opens your airway), oral appliances (small, plastic devices that are worn in your mouth to hold your tongue and jaw forward), surgery or by a combination of these approaches. CPAP interferes with socialization. The mask itself, the noise of the machine, the thought of a bed partner wearing a cumbersome device at night can adversely affect even a mature relationship. The fear of a destroyed relationship has led many sleep apnea sufferers to abandon their CPAP machine leading to low compliance and a situation dangerous to their health. Dentistry offers a less obtrusive solution – a dental mouthpiece worn totally within the mouth. If you or a loved one snores or has had difficulty wearing their CPAP we have the years of experience necessary to offer a dental solution. Oral appliance therapy and Dental Sleep Medicine can make a difference. Custom made oral appliances reposition the tongue and the lower jaw forward during sleep to maintain an open airway. In 2011 Dr. Lawson achieved his Diplomat status in Dental Sleep Medicine. Dentists trained in Dental Sleep Medicine like Dr. Lawson know how to select, fabricate, fit and adjust the appliances to help patients breathe freely during sleep. Follow-up visits and a post adjustment sleep study will help Dr. Lawson confirm the efficacy of the treatment. Prior to treatment however a sleep study must be done to confirm or rule out sleep apnea. Dentists are not permitted to diagnose sleep apnea. Sleep Apnea is a medical diagnosis. If you have not completed a sleep study our Dental Sleep Therapy Centre can facilitate a sleep study and a subsequent consultation if necessary with the medical sleep specialist to discuss the diagnosis. Only after a diagnosis has been made should an oral appliance be considered. At the Assessment appointment Dr. Lawson and his staff will review your comprehensive medical history and complete a clinical examination. The clinical examination will include a TMJ evaluation and an airway evaluation including acoustic imaging with Ecovision. An oral appliance worn during sleep prevents the airway from collapsing by gently moving the tongue forward. 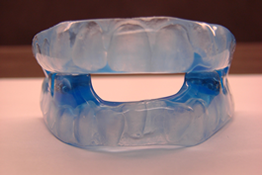 There are many appliances designed to treat snoring and sleep apnea. However Dr. Lawson will be able to select the appliance design that suits your needs best resulting in maximum treatment efficacy. Dentists like Dr. Lawson who treat TMJ – temporomandibular joint disorders – are an excellent choice to manage the airway with oral appliances because they are very aware of the jaw position required when fabricating the appliance. This is an important consideration because often TMJ issues need to be managed as a component of the airway treatment. 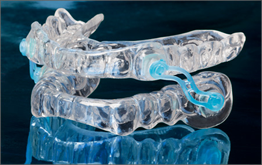 In fact, sometimes TMJ appliances can be used to improve the airway and treat TMJ symptoms at the same time. Appliances are light, easy to wear and comfortable.